DakotaFire Systems™ is the leader in fire suppression systems and unique firefighting equipment and is the only system of its kind. The DakotaFire Systems™ can be used for not only fire protection, but also as a suppression system putting out fires that are already in progress. This tool should be an essential part of every fleet to help crews better put out a fire, while also ensuring the safety of every crew member and their fire engine. The DakotaFire Systems™ has revolutionized the way firefighters fight fires. The pressurized suppression system can put out a fire faster than typical foam because the gel is made up of 97 percent water. The gel's highly-absorbent polymers hold the water and slows the evaporation rate of water by 10 times the normal rate. Our system helps to stop fires quicker than any other foam application on the market. 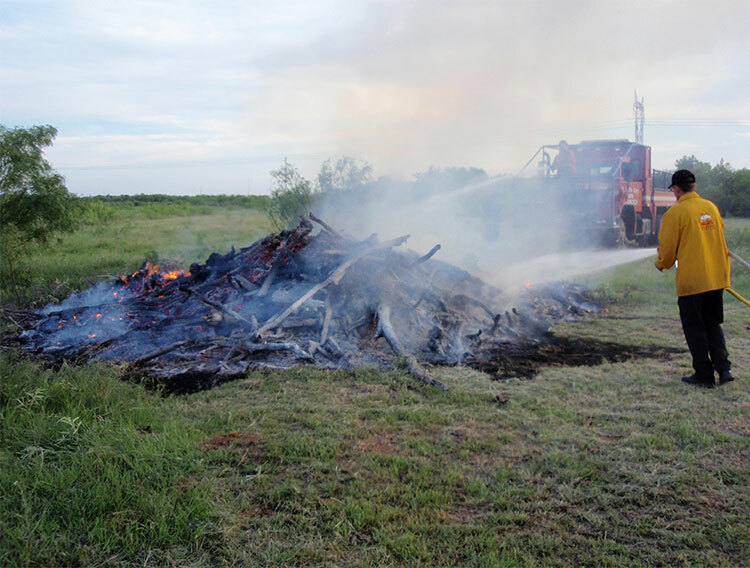 In the mesquite burn shown above, two similar brush piles were soaked with diesel fuel, ignited and then allowed to burn for 15 minutes. Then one was attacked with a one inch water line connected to the DakotaFire Gel System. This pile was extinguished in 40 seconds with 15 gallons of water and approximately one-half gallon of gel concentrate. That pile never rekindled. The second pile was attacked with an 1 1/2 water line with foam and it was attached to a 6x6 fire truck carrying 1000 gallons of water. After spraying the entire 1000 gallons of water mixed with foam, the pile continued to burn. Gel is classified as a water enhancer; and foam is classified as a wetting agent. Water enhancers extinguish fire faster than wetting agents. Naturally, this gel is the best option to have in your crew's arsenal. DakotaFire Systems™ is the perfect suppression system because not only does it have the power of the pressurized gel working for it, but the system can also be used with your basic water tank setup on any existing truck. The nozzle allows for both water application and pressurized gel application, providing the maximum suppression capabilities. This system will perfom reliably in spite of variances in altitude, water quality, RH, and temperature.